Peter Grose’s engrossing An Awkward Truth (2009) examines the catastrophic Japanese bombing of Darwin in February 1942. The book opens up with an anonymous poem of soldiers’ doggerel Bloody Darwin with eerie parallels with John Cooper Clark’s 1980s British urban classic Evidently Chickentown. “This bloody town’s a bloody cuss/No bloody trams, no bloody bus/And no one cares for bloody us/Oh bloody, bloody Darwin.” The poem is apt as the story of Darwin’s first war bombing (it would be attacked a further 58 times) is one of official incompetence, wilful neglect, looting, desertion and failure of leadership that cast a dark shadow on Australia’s war record. While Grose discusses what 1955 Territories minister Paul Hasluck called a day “of national shame”, he also uncovers stories of personal heroism and dogged counter-attack that deserve to be remembered. 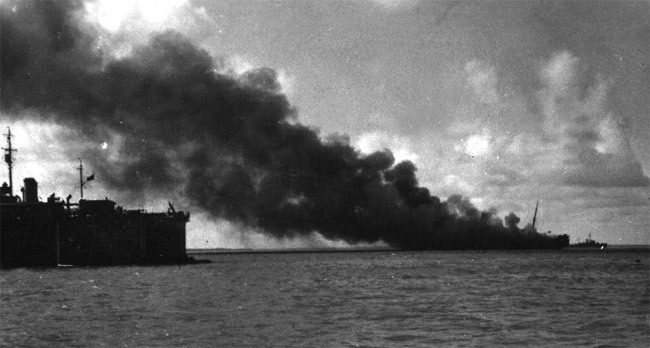 The force attacking Darwin on 19 February 1942 was the same as attacked Pearl Harbour two months earlier. Led by renowned “Tora Tora Tora” pilot Mitsuo Fuchida (who lived until 1976), they learned from Hawaiian mistakes and caused more damage in Darwin, taking more civilian casualties and sinking more ships. At the time Darwin stood with Coventry as the two biggest air attacks of the war. The toll of 300 remains the deadliest single event on Australian soil. The villain of the book is not Fuchida but former NSW Country Party politician Charles Aubrey Abbott who dabbled with the extreme right. He was appointed NT’s administrator in 1937. When war arrived in 1939, Darwin accepted it apathetically believing it was still half a world away. In 1941 Japan entered on the Axis side. and Darwin was suddenly a target. On 7 December Japan launched a double strike hitting out at Pearl Harbor while launching a large ground-based invasion of Malaya, supported by a bombing campaign from Hong Kong to Singapore. Disaster followed disaster. McArthur’s indecisiveness cost the Philippines, Guam fell as did Singapore. Japan turned attention to its real target: Java’s oilfields. Across the sea in Darwin, authorities drew up evacuation plans. Abbott sat on the plans and argued a state of emergency would cause unnecessary panic. Women and children were eventually taken out by boat in a chaotic evacuation. Darwin’s port was transformed into a supply base for the defence of the Dutch East Indies. Ships piled up in the harbour where inefficient design and strike-prone wharfies made for painfully slow loading and unloading. Including Royal Australian and US Navy vessels there was 45 ships in Darwin harbour at the time of the bombing. On 19 February, the Japanese Nagumo Force with four aircraft carriers rendezvoused in the Timor Sea south of Maluku, 350km north of Darwin. It unleashed 188 aircraft, five more than in the first wave at Pearl, which set course for Darwin. They flew southward between Bathurst and Melville Island before turning in a loop to approach Darwin from the south-east. This had the double advantage of having the sun behind them and being the least likely direction of attack. They arrived in Darwin without warning around 10am. One group attacked the port while the other strafed the airfield. The bombers exerted maximum damage on the port locomotives, railway trucks and scattering oil lines which caught fire killing those who dived into water for safety. The town lay just beyond the port and suffered heavy damage. A direct hit took out the post office and communication building killing nine civilians. Anti-aircraft guns returned fire but lack of practice and problems with shells in tropical heat meant they were mostly ineffective. At the airfield, the second force knocked out planes and communication equipment. Ships struggled to flee the carnage. The USS Peary sank with 91 dead. Fifteen died on the William B Preston, also sunk and 12 died on the hospital ship Manundra though it did not sink and continued to accept casualties. By the end of the raid, Darwin was a smoking mess. The Japanese were not finished and 54 aircraft arrived for a second attack two hours later. They concentrated on the airfield dropping 13,000kgs of high explosives before flying off at 12.20pm. Neither Abbott nor the army commander took control of the situation. Abbott directed police away from rescue efforts to pack his valuable glass and china and take it south to safety. The “Adelaide River Stakes” began, a mass exodus from Darwin as rumours filled the void of official information. A convoy of vehicles set off to Adelaide River 120kms south based on a rumour civilians had been ordered to leave town. Anything that could move did, and the road was jammed by drivers in the red dust. The Army neglected to start a salvage operation, blowing any chance of giving surviving aircraft a chance if the Japanese came back. Army units dispersed without orders to other parts of the Territory. A day later the military took control. They took eligible men from Adelaide River and signed them up for the army. Non-essential people were evacuated and a week later the NT was placed under Army control. There remained the tricky problem of what to tell the world. Unlike Roosevelt after Pearl, the Curtin administration didn’t trust Australians with the truth. Curtin was in a row with Roosevelt and Churchill about withdrawing Aussie troops from the Middle East. Journalists in Darwin had splashed the news of the attacks but the Government was keen to underplay it. They reported the death tally as 19 with minimal damage. Abbott also pretended in his communications Darwin was back to normal. Hah I’m really the only comment to your amazing read! Please ignore that first comment on your piece. I found it very informative and interesting. I saw it being advertised on tv later this month I think it is and so thought id come on and find out more before watching it. I knew that there was something shady about it but nobody ever talks about it. You told it like it was and also found the good side to the story as well. There are always brave stories to be told with all these disasters.